I’m so excited that it’s FINALLY the best month of the year! My birthday is December 10th and Christmas is a mere 3 weeks away, so cheers to that. I started my new job as a Senior Account Manager at a social media agency in LA two weeks ago, and this past week I was traveling in NYC (see pics from the trip on Instagram) to meet some of our clients. The main account I am overseeing includes the Mezzacorona, Stemmari and Rotari wine brands (give them a follow)! I’ve always wanted to work with in wine in some way, so I’m stoked about this new opportunity and can’t wait to share this new journey with you. Needless to say, I’ve been a bit MIA around here, but I’m ready to get back to creating content to help you get the most out of your shopping (like how to make sure you’re getting the best deals!) for the rest of this holiday season. 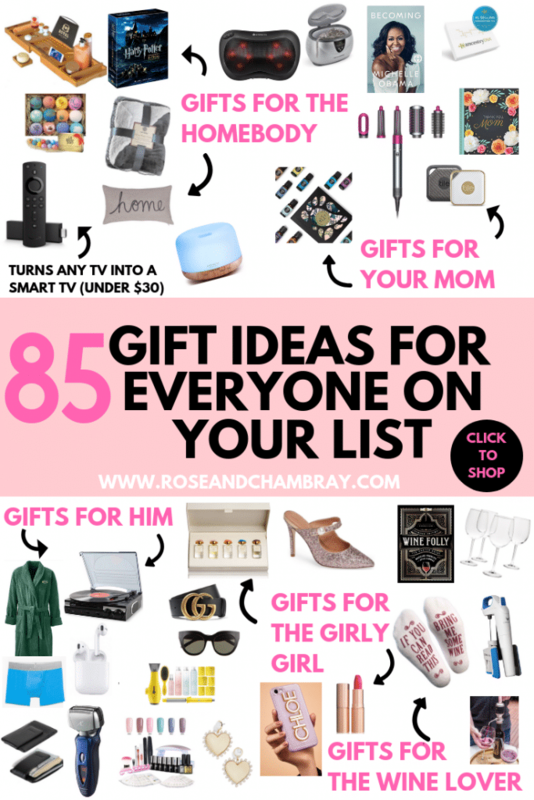 Today I wanted to share all of my holiday gift ideas that will satisfy everyone on your list! Keep scrolling to see over 80 gift ideas for the best friends, the moms, the guys, the wine lovers, the homebodies, the hostesses and the girly girls in your life. Hope these recommendations are helpful! omg this list is EPIC!!!! I literally want everything. and we splurged and got that hair dryer for my mom this year, I know she’ll love it!